By 1979, the summit of Mount Everest had been reached by every major ridge, yet a large expedition from Yugoslavia arrived to top their last achievement of making the first ascent of Makalu South Face. The West Ridge of Everest was a long unconventional line to the top. It was first climbed by the Americans in 1963, and is still well celebrated in the United States today. Except the Americans climbed only the upper half. The Yugoslavians came to traverse it all starting at the base, low in the Lho La pass. Like many national expeditions in those days, it was huge. It included 25 Yugoslavian mountaineers, 19 Sherpas, three cooks, three kitchen boys, two mail runners, 700 porters and 18 tons of gear. The ascent had to overcome a steep and severe gap, which required a winch to overcome so it was possible to haul the gear over the broken portion of the ridge. All efforts and ingenuity combined, the Yugoslavians positioned three Slovenian climbers at Camp V who were close to each other, Nejc Zaplotnik, Andrej Stremfelj, and Andrej’s brother, Marko Stremfelj. Shortly after starting out from Camp V, however, Marko’s oxygen apparatus malfunctioned. After some jostling with the regulator, Marko was forced to turn around. Andrej was conflicted and frustrated about ascending without his brother; it was so unjust. Andrej went on with Nejc, but they weren’t free of issues, however; both their equipment failed and only Nejc had enough tanked air to get him to the top. Andrej said he’d go on and as high as long as he could. The summit was far, and the day was getting late. Nejc was determined to reach to top on this push, so he steeled himself mentally for a cold, dark high-altitude bivouac, which likely meant losing toes, fingers or limbs to frostbite and possibly death. Except when they radioed base camp, they realized that it wasn’t as late as they had thought; they still had plenty of daylight ahead. Buoyed, they plodded upward. But upon reaching the Chinese tripod on the summit, elated, the question was daunting: We can’t go down the way we came, so what the heck do we do now? This was a mere moment of one of the dozen-and-a-half stories Bernadette McDonald retells with prose sometimes bordering on poetry and with the courage to cuss when the tension required it in her latest award winning book, Alpine Warriors (2015). Bernadette McDonald has been in a unique position to uncover some of the hidden stories among European climbing communities. 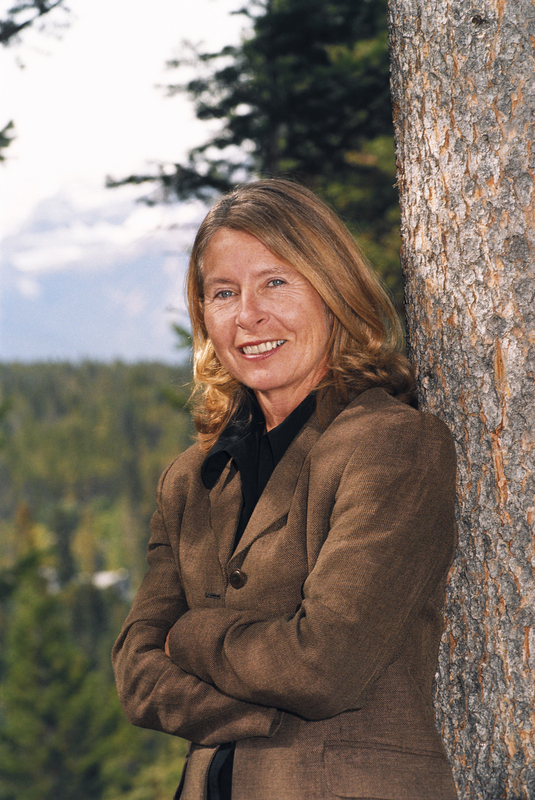 She oversaw mountain culture programs, including the Mountain Film and Book Festival, at the Banff Centre in Alberta, Canada, and she has published (or edited) over eight books. Perhaps most notably Tomaz Humar (2008) and Freedom Climbers (2011), both of which won the grand prize in the Banff Mountain Book Competition when they were written. Although Yugoslavian climbers entered the Himalayan arena late, the international climbing community was stunned by their accomplishments on Makalu and Everest and awed by their near successes on the South Faces of Dhuahlagiri and Lhotse. There were many more: Kangbachen, Trisol, Cho Oyu, Shishapangma, Gaurishankar South Summit, Annapurna, Gangapurna, Yalung Kang, Ama Dablam, Lhotse Shar — the list of ascents went on and on. As their triumphs accumulated, confidence grew. So did national pride. 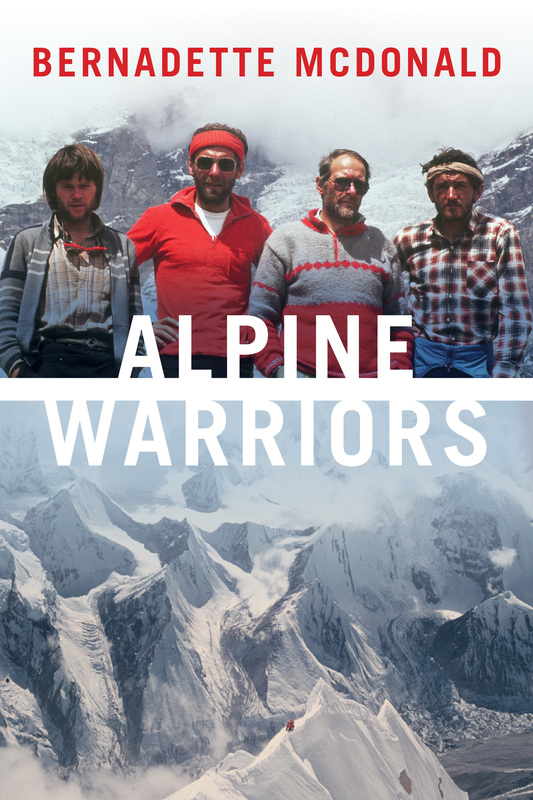 Alpine Warriors tells a story about Yugoslavia after World War II and the dozen-and-a-half alpinists from Slovenia that changed Himalayan climbing. These climbers were from a war torn country, with religious, political, and ethnic fragmentation reduced to poverty. These conditions, arguably, and combined with the location near the Tatras, produced a hardened group and several leaders that brought these hardened men to the Himalayas, not in the heyday of the 1950s and 1960s when the 8,000-meter peaks were being climbed by their major ridges, but later, when the new challenges had to be spotted and seized before anybody else. To name a few of the great alpinists McDonald writes about, Ales Kunaver was the leading visionary and teacher, Nejc Zaplotnik was their spokesperson and spiritual leader, and Francek Knez is the quiet outsider that climbed big walls with a grace and ferociousness the likeness no one has ever seen. These three alone are worth an English-language biography. It was a difficult field for any mountaineering book competition, in 2015, whether it was Banff, the Boardman Tasker, or the American Alpine Club Award in Literature. Alpine Warriors was up against Kelly Cordes’ The Tower: A Chronicle of Climbing and Controversy on Cerro Torre, Barry Blanchard’s The Calling: A Life Rocked by Mountains, and John Porter’s One Day as a Tiger, just to name a few. Of course, it helps when you have a good story to tell, which all of them do, but these folks can all write. I’m not privy to what the judges at Banff discussed (I wasn’t even one of the book category pre-readers), but I know from reading Cordes’ and Blanchard’s books, McDonald might have had her closest competition yet. They all had the ability to make their prose dance like poetry, but McDonald had the touch and a perspective. She didn’t just tell a story about a life. She didn’t just tell about the lives that came to a temple. She told the story of a people through the lens of climbing. Reading Alpine Warriors I learned more about Yugoslovians and Slovenians than I was taught in 20th Century European Politics and Soviet History in college. I read about 20 or so mini-biographies about Slovenian alpinists in Alpine Warriors. I learned about Nejc Zaplotnik’s Slovenian classic book, Pot, which means “the path” or “the way”, and I read the first passages translated and widely distributed in English, thanks to McDonalds’ painstaking work over the phone with an interpreter. It opened my world to a people and an experience that is unique and was previously hidden from me. My mother was born in America but her first language was Polish. She still speaks with a hint of an accent if you know to listen for it. I took for granted any appreciation for my Polish heritage for most of my life. When I was young, I was teased for being a “Polack,” which, I was crudely informed through jokes, were stupid people. So I conveniently hid that part of me for a while and emphasized my Hungarian, English and German heritage from my father’s side whenever national background mattered. Now that I am older and thankfully more mature, I’m fond of my collective heritage. I’ve always enjoyed my Polish traditions at Christmas Eve and at Easter — two of the holiest days of the year for Catholic Poles. Still, I never thought that I would have any real reason to have pride in being Polish. Poland, to the best of my knowledge at one time, was merely another country ransacked by the Soviets and the only amazing people from there were Pope John Paul II and Lech Walesa. Later I learned of alpinists Wanda Rutkiewicz and Jerzy Kukuczka, though I only thought of them as alpinists, not as Polish alpinists… until recently. My perception of Poland changed in the context of mountaineering. 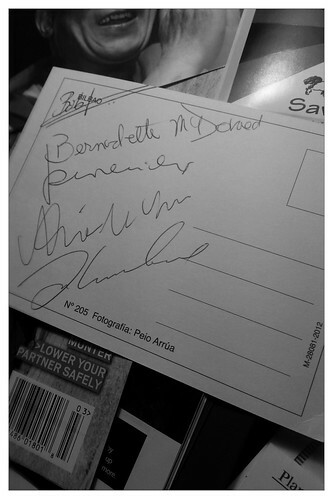 I read Freedom Climbers by Bernadette McDonald (2011) at long last. Between responsibilities with family, work, and helping my wife launch her start up (which opened on Monday), my reading habits have relied on taking small sips rather than large gulps, as author Stephen King would put it. Albeit for me, very small sips. McDonald’s book has won several awards, including the 2011 Banff Mountain Book Festival Competition and the 2012 American Alpine Club Literary Award, among others. At the outset of reading it, I didn’t think there was anything that special in the first few chapters. I already knew much about Wanda Rutkiewicz, Jerzy Kukuczka and Artur Hajzer as well as a little about Krzystof Wielicki. They were all great Polish alpinists, and Hajzer is still attempting winter ascents of the 8,000 meter peaks that haven’t been summitted those days. But by the middle, and certainly by the final two chapters, I realized that McDonald didn’t tell me why I needed to learn about them all together as a group, she showed me. I had to go on her journey — chapter by chapter — to get fully get it. Freedom Climbers is the story of some — but not all — of the significant alpinists that made Poland the Himalayan powerhouse of the 1980s and 90s. 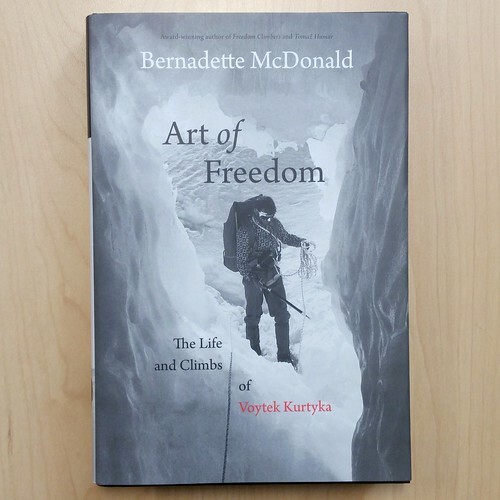 She demonstrates through examples, told through short biographies, and explaining the historical context of the economic and social forces shaping their environment, to show why what they accomplished was so important in the climbing realm and even of greater significance in the idea of human freedom. I’m tempted to repeat McDonald’s punchline and restate some of her conclusions about why they were so prolific in the Himalayas, but they lose their force of truth without the examples and stories that precede them. Instead, here is a sampling of what made them so impressive: They were poorer than any other nationality of climbers, ca$e in greater numbers and yet spent the most time in the Himalayas. Their gear was inferior and often homemade and yet they created new routes in the most awful conditions, including winter. Despite lack of government permissions and other support, they were innovative in gaining mobility and visited the mountains other than their beloved High Tatras. The book also brought to light a climber that previously escaped my attention, or at least qualities that I didn’t know he had: Voytek Kurtyka. For me the story begins with a mountain seriously ambitious alpinists consider beautiful: Gasherbrum IV. It’s a 7,000-meter peak, but may have qualities that are tougher than any of the 8,000ers, including K2. Kurtyka was part of the two-man team that first ascended the high, vertical Shining Wall. While I could recount his other notable climbing accomplishments, like his ascent of Nameless Tower in the Karakorum, what fascinates me most about him is the combination of his accomplishments and his philosophy toward the mountains and climbing. In many ways, he’s helped me — through the writing of Bernadette McDonald, of course — understand climbing at the level David Roberts has delved into the questions of why do we choose to suffer so to climb, through cold, avalanche risk, damaged or ruined relationships for the experience of a climb. Kurtyka developed a philosophy that borrowed from and closely resembles the Buddhist Middle Path and the Samarai Path of the Sword. He wrote about it and called it the Path of the Mountain. He drew his energy from nature, but only the mountains would satisfy his desire for connection; only in the mountain environment would he face fear, anxiety, exhaustion, hunger and thirst and peer into another level of his soul and finding a special peaceful place. This approach brought Kurtyka to face high challenges that were private. Climbing the 8,000ers in a day when his former climbing partner Kukuczka was racing Reinhold Messner to top out on all 14 was the antithesis of Kurtyka’s climbing style and spiritual goals. 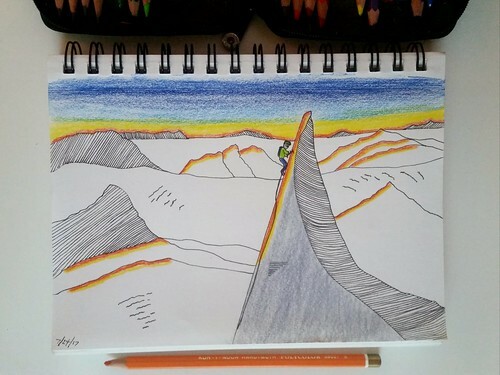 He climbed for 30 years and constantly pushed the limits, not unlike Steve House today. What may have kept him alive and successful, McDonald argues, was that unlike Kukuczka, he never allowed his ability to detect and weigh risk be pushed aside; she cites numerous “strategic and hasty” retreats that seemed irrational at the time but proved to be “mystical” and insightful. I’m grateful McDonald told this story. It’s a wonderful narrative, full of mini-biographies and gives a better understanding of the struggles under the Soviets and what greatness actually entails.